I don't know about you, but it gives me an extra boost in confidence when I am reminded that even the Big Guys can make mistakes. Steven Spielberg's 1990's live action version of 'The Flintstones' was certainly not Oscar material. Audiences kept away in droves, and category after category of merchandise was left hanging on the racks for months after the stone age ship had sunk beneath the cruel sea of mass opinion. Not that the classic 1960's series was lacking in merchandising... but at least it came from the heart. Back in those days, the quality of the TV show came first, then any licensing decisions, not the typical vice versa arrangement of today. And as the Best of the Best in entertainment came out of 60's Bedrock, the Flintstones toys from that period were the Best of the Best too. Numerous inspired plastic toys (vehicles, figures, Bedrock village playsets) graced many a prehistoric toybox, but it would have to be the fabulous and sometimes bizarre series of Japanese tinplate toys which were the jewel in the crown of Flintstones playthings. Japan's boom time in toy manufacture (post WW2 until the late 1960's) saw it out produce and out perform the rest of the globe in its ingenuity, enthusiasm and the mass appeal of its products. Some toys from this period are amongst the most collectable ever produced. 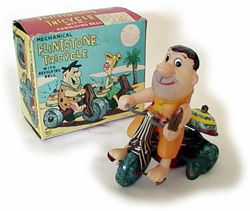 Japanese companies were always quick off the mark to produce toys based on TV characters that would enchant the enormous US marketplace, and the Flintstones were no exception. The most striking of these were made by Louis Marx and Company (often marked Linemar Toys). 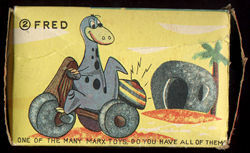 Here are just a few examples: a 55cm long, battery operated plush purple dinosaur with a vinyl head, seated upon which was a small Fred Flintstone figure, a-la the TV show's opening; an all tinplate and brightly lithographed Dino the Dinosaur, 20cm long and powered by a clockwork motor, with vinyl-headed Fred riding Dino cowboy style; and the Fred Flintstone Flivver, a tinplate and plastic friction-drive vehicle, just like the family car, with a brittle plastic figure of Fred sitting behind the wheel. But my absolute favorites are the fabulous and funny series of Flintstones clockwork tricycles. Transportation in Bedrock was definitely a tricky business. If you had a car, you wore out the soles of your feet. If you rode astride a handy Whateverasaurus you might just get saddle sores. How was one to overcome these Triassic traumas? Why, with the Mechanical Flintstones Tricycles of course! Fred & Co cracked the nut in 1962 with Marx's assistance. The trikes themselves are all tinplate with exquisite woodgrain and stone lithography. They differ only by their riders, who are constructed entirely of celluloid. As well as the traditional elastic jointing of the arms, each has a clever hollow lower leg assembly. This allows the feet to move up and down, as if really pedaling. 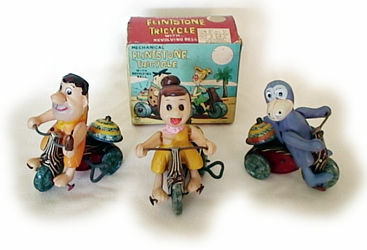 Three pretty and petite clockwork tricycles were released, each being a mere 3 inches high: Dino, Wilma, and Fred. Their cute watercolor-art box was generic, with all three characters shown. The character inside was labelled on each end flap, for point-of-sale accuracy. Sadly, great character toy possibilities like Barney, Betty and Hoppy the Hoparoo were neglected yet again... still, we should be grateful that Marx saw fit to bless us with as many fantastic Flintstones toys as they did. What a way to remember Bedrock! Have your article published here on Toyzine?